Upon review of selected artwork, artists accepted to participate will receive an invitation to compete in upcoming art competitions. Interested artists are able to apply at anytime during the year. If they apply after the Intent to Participate Deadline, they will be invited to the following year’s Art Competition. A detailed competition package will accompany the invitation, including the Artist Agreement. Canadian citizens and landed immigrants are eligible to participate in the art competition at the invitation of Wildlife Habitat Canada. If the participant is under the age of 18, a letter of consent signed by the parent(s) or legal guardian is required and must accompany the confirmation of intent to participate. Persons who have previously won the art competition during the preceding three (3) years, are ineligible to submit an entry in the current year’s art competition (E.g. if you won the 2018 Art Competition, the next time you can compete is the 2022 Art Competition). 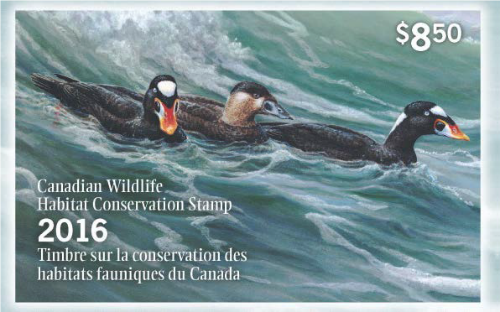 Members of the art competition judging panel, employees and members of the Board of Directors of Wildlife Habitat Canada, employees of the Federal Department of the Environment or Members of Parliament and their immediate families and relatives are ineligible to submit an entry. • your intention to submit an original entry by the deadline. • Compliance with Art Competition rules. • Compliance with the Artist Agreement if you are declared the winner. Invited artists must have their original entries submitted to, and received by, WHC by the deadline. The entry fee must accompany the original entry. Competing artists will be notified of the Competition results with feedback on their entry. All entries, excluding the winning entry, will be sent back to the artist. The entry fee for the art competition is $30.00 and must accompany all Art Competition entries. Invited artists must submit only one (1) original entry. Entries must be an original multi-coloured painting in the artist’s choice of medium (no reproductions). Please Note: Pastel submissions will no longer be accepted (as of 2018) due to the fragile nature of the piece and challenges associated with the reproduction of Stamp products. The size of the submissions must be between 12” x 16” or 12” x 19”. 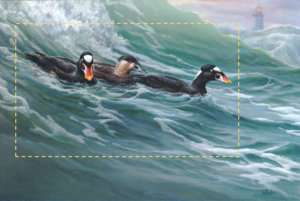 The painting must portray the eligible waterfowl species / migratory game bird in its breeding plumage and natural habitat during breeding season. The habitat of the species must be clearly defined. A landscape design must be incorporated into the painting along with the traditional image of the waterfowl. A minimum of five independent judges are selected for the panel, including an ornithologist and a representative of Environment and Climate Change Canada. o Technical suitability for reproduction as a Stamp and a lithographic Print.